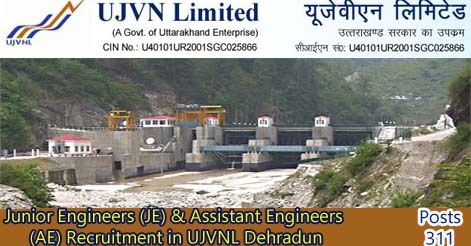 Uttarakhand Jal Vidyut Nigam Ltd (UJVNL) Dehradun has released notification for the recruitment of 311 posts of Junior Engineers (JE) & Assistant Engineers (AE) in Uttarakhand. UJVNL Dehradun invites online applications to fill up the vacancies of 311 JE & AE (Trainee) in Uttarakhand. Help us to improve this article/job posting "311 Junior Engineers (JE) & Assistant Engineers (AE) Recruitment in UJVNL Dehradun – Last Date Extended up to 17 Aug". We would be glad if you can comment below and provide your valuable suggestions and feedback. If this page have any wrong information/list or out of context content, then you can report us as well. I Was clear 12th class 2012-2013 in Commerce with 69.33% PUNJAB BOATD. Hi Ankit, for latest jobs updates for B.Com, subcribe to https://govt-jobs.euttaranchal.com/by-qualification/b-com and get latest jobs in your mail. इन रिक्तियों में अनुभव नहीं माँगा है, तथा हर कोई भर सकता है फॉर्म …. Diploma in Electronics wale fill up kr sakte h kya form sir. जी हाँ, इलेक्ट्रॉनिक्स डिप्लोमा वाले कर सकते हैं आवेदन …..
Hi Raman, check out detail advertisement link given for details. please provide syllabus for AE post for mech branch..
sir can i apply for this job im btech fresher in electronics & telecommunication…. is Regular part time diploma student also apply for JE POST. Sir my last semester result is pending ,which will be declared soon in August..
Plz given the information that manical holders apply these form.. Diploma in mechanical prod. Fresher in 2015 bhi apply kr skte h kya ? Diploma holder 1 year exprns. JE ki post ke liye electronics diploma vale bhi apply kr sakte h ? is this not for electronics ??? Sir 47% no in 10th class and diploma main 71% no h if i can apply this from. Pls tell me no. Of vacancy of diploma in electrical. kindly provide previous year question paper for AE electrical engineer. Sir syllabus bhi bata dete to badi kripa hoti apki…..
Sir,I am B.E Civil from Bihar State..I do not have registration in utrakhand eployment excanage.Can I apply? Sir,maine part time regular diploma g.b pant ploy.se mechanical main kiya hai .Aur .ye 4 yr ka hota hai kya main apply kar sakta hoon.please guide me. employment exchange no in up vale apply kr skte h kya for je post sir … plz reply ??? I have fill up the online form for post of UJVNL junior engineer. But I am confuse for demand draft rupees value because I am a physical handicap on one leg so please confirm to me my demand draft rupees value for submitted the form for the post of junior engineer in UJVNL. Hi Yogesh, it is clearly mention in advertisement that for GEN/ OBC / All other Categories Rs 500/- & SC/ ST RS 250/- . So you will have to make DD of Rs 500/- . I have done 3year diploma in civil branch…but sir my last year result come in august 1st weak…i have clear result in 2nd year without any back.. Please tell me why distance education candidate cannot apply this job. I know this might be a silly question, but I am not able to understand the complete advertisement regarding recruitment eligibility criteria as my Hindi is not so efficient, I just want to ask if only Mechanical Engineering is eligible or related branches (especially Automobile) is eligible or not. Your response will be much appreciated. sir. i am b.tech passed out for ee branch. i want to a.e electrical question paper ,. Sir can other state candidate can apply for the post of je requirements of ujvnl.if yes kindly inform me procedure to register uttarkhad employment exchange at my mail I’d.thanks. sir kya ye computer science bale bhi fill kr skte hai. Test kb hoga in posts k liye…..
Dear sir ,please sent some last years question s papers and syllabus for AE examination. Sir admit cards kab tak available honge and please send me the syllabus of AE mechanical on my email. Sir there is no any confirmat mail/sms by ujvnl after complete d aplication form…. admit card detail for J.E. electrical and examination date. Pls send me JE syllabus in my E-mail ID. sir, can u tell me when this junoir engineer exam date ? sir 1/2015 je exam kabhi hoga. i have completed my diploma in Mechanical Engineering from distance education. could i apply. Sir, maine mechanical me diploma kiya h… Mujhe job chahiye UTTRAKHAND me… Please meri help karo. How many post in electronics diploma? When admit card available for AE exam, i followed the site BT haven’t got any info about AE exam,. Please answer me very soon. sir what is the mean the last date 17 aug-16. I have instrumentation engineering degree, can i apply for any post. I done b.tch from ECE branch, Can I eligible to apply for A.E post ? can also apply this post ? sir good afternoon,when AE exam wiil be conduted..plz ans..
Sir i am abhishek, can i fill the form I have completed my graduation Bsc in Information Technology and I have 3 years GNIIT diploma from NIIT Dehraduun. Hi I Nitin tyagi and My query how many age required and my exp. private sector in indore development area of engines. Date of publication is 17 Mar 2016 but other all details shown older like last date 17 Aug 2015. please clear what is the last extended date of submitting application. I am student of final year , my b-tech will completed in may 2016 . Am i eligible to apply for the above assistant engineers (A E) post. I hav complted my 3 year diploma in mechanical engineering from ubter with 1st class in 20114. Since then, i Waz working there one & half year experience as a mechanical Engineer in a 330 mw hydropower plant(running by GVK energy) on Contract basis. Since the project is about to complete, i hv to leave the company asap. And i ame working with dy auto india pvt ltd in this time. Do i have any better chance to get a job in uttrakhand..
my name is vinay kumar rajak.i have complected b.tech from electrical engineering 2016 and my agregate % in b.tech 65.16%.i am fresher.so i requested to u have u any job please infrom me.